Copyright © 2004 W3C® (MIT, ERCIM, Keio), All Rights Reserved. W3C liability, trademark, document use, and software licensing rules apply. W3C roadmap for addressing the accessibility of dynamic web content. The PF working group has developed this roadmap for making dynamic web content more accessible to people with disabilities. To assure this roadmap and the corresponding technologies produced to support it will interoperate in a manner that improves accessibility for the widest range of web technologies, the PF working group asks for comments and suggestions on how this roadmap can be improved for use in the technologies that you or your working group are developing. In general we prefer public comments so that all people (including the general public) reviewing the document can be aware of your comments, but you may also send member confidential comments that will be available only to the working group and other W3C members. This is the latest draft by Rich Schwerdtfeger of the Protocols and Formats working group. 4.1.1 Provision for the Role attribute "What the object is"
4.1.2 Provision of the accessibility state information "What meaningful properties does this object have at this time?" 4.1.3 Provision of the keyboard or input focus "What object am I working on?" 4.5.1 XML Events and Handlers - "adding purpose to actions"
Accessibility is dependent on abstracting semantics from both content and presentation information. Extracting this semantics from today's HTML content is typically not reliable. Today, semantics are limited to the tag elements names. HTML allows content to be repurposed for presentation formatting without providing a way to convey this information. A common example of this is the use of tables for formatting content as opposed to style sheets. HTML, when combined with script and CSS may be repurposed to create dynamic custom components without the ability for the author to convey this information to the native accessibility architectures designed to support dynamic GUI content. HTML lacks the ability to attach meaningful meta data about document structure. Figure 1.0 illustrates a typical DOM node in a Model-View-Controller architecture. On the node, data, or the "Model", which should include semantic information, is separated from the user interface presentation, the "View." Here, the document element is managed by the user agent based on the default behavior of the element. The user agent's default behavior at the document element forms the controller. 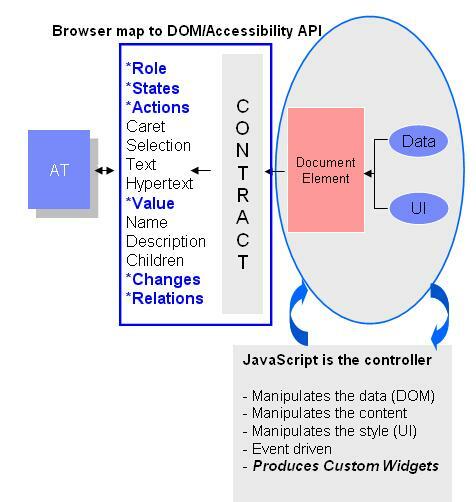 Placed between the DOM node and the asssistive technology is a box containing the contract provided by the user agent to the assistive technology. This data includes typical accessibility information found in the accessibility API for many of our accessible platforms for GUIs (role, state, caret, selection, text, hypertext, name description, parent/child information, parent/child information, and relations). For HTML and other W3C markup, the accessibility information provided is dependent on that which is provided by the element's tag name and any accessibilility attributes that map to that provided. For example, the accessible role of a table is table. The accessible description would be provided by the author by assigning a title attribute. Web ontologies allow for storage of semantic information about objects and how they relate to others in the ontology. Accessibilty architecture today is centered around object technology. Each object in an application or document, exposes accessibility information about itself to an assistive technology. Dynamic content authors must be able to store the accessible meta data in the document independent of how it is rendered. Assistive technology vendors should not be required to poll an application for changes in accessibility information. This problem needs to be solved quickly. There are a number of efforts underway, such that minimal changes may be required to bring them to the level needed. The solution needs to be light-weight in order to see uptake among HTML authors. The solution needs to be scalable, i.e., make simple things easy while making complex things possible. Like other Web solutions, our solutions must be internationalizable. This is a critical mistake made by people creating a new accessibility model. Developers must be on board early on so that they may contribute feedback and start producing workable solutions early. What is clear from the problem statement is that the author does not have the ability to provide the appropriate accessibility information in the markup to support the accessibility APIs on the target platform. This problem is not limited to HTML. It extends to other markup, including SVG. Some of these issues will be addressed through the introduction of declarative markup. New work being done on XForms and XHTML 2 are designed to incorporate accessibility features through the declarative markup of the language. This has the added benefit of reducing the enablement effort by authors through leveraging the existing accessibility information stored in these markups to offload some of the accessibility work to the User Agent. That said, we need to build a bridge which will fill the accessibility gaps on today's HTML markup which will lead to broad applicability to today's markup while moving forward with declarative markup to reduce the enablement effort. Using Figure 1.0 as template for addressing the problem and 508 accessibility standards, a Gap analysis has been constructed in Table 1.0 to show where the gaps are in the infrastructure and what W3C standards should be used to address the problem. In right column, table cells which are empty or which indicate a limitation represent accessibility gaps in HTML and XHTML. At this time, the primary effort in the W3C WAI Protocols and Formats working group is to focus on an extension to XHTML 1.1. It should be noted that XHTML 1.0 could also be enhance to support this extension through the use of a hybrid DTD which incorporates the extensions. The reason for focusing on XHTML 1.X is that XHTML is extensible through the use of namespaces and because it is renderable by today's browses. For this work, we will be producing a document called the Accessible Adaptive Applications (AAA) document and a GUI role taxonomy document. The AAA will constitue extensions to XHTML 1.1 to fill most of the gaps needed to support accessibility API infrastructures and dynamic XHTML content. It will also borrow the role attribute from XHTML 2 for which a set of accessible role values may be applied from the WAI GUI Role Taxonomy specification. The Role taxonomy specification will provide the necessary core roles found in Accesssibility API sets for Windows and Linux. Additionally, it will contain roles which are representative of document structure. The use of document structure is necessary for assistive technologies to navigate complex documents and to know when they have entered active areas of a web page such as in the case of a dynamic scripted web application. It will be designed to assist the user agent or authoring tool in determining what properties are supported by a given role and assist with accessibility api mapping of these properties. The taxonomy will be like a class hierarchy used to convey semantics and structure and therefor knowledge about each role. At this time that taxonomy will be written in RDF. The GUI Role Taxonomy specification is meant to be cross-cutting. XHTML 2 introduces the role attribute as part of its built-in accessibility support. The common roles defined in this taxonomy may also be applied to XHTML 2 content and other markup such as SVG should those efforts allow for a mechanism to reference these common roles. with limited use of AAA. All XHTML 2 elements shall be focusable. Table 2.0 shows the roadmap for filling the gaps in Table 1.0. The effort is designed to fill the gaps for HTML content. Required components marked with an asterisk indicate gaps to fill in the roadmap. As you move to the right in the table a transition to more declarative markup will take place. The use of declarative markup reduces the enablement effort required while better addressing accessibility. Declarative markup is used to build accessibility in rather than bolting it on. Subsequent sections highlight the requirements and standards efforts set to address the gaps. Adaptive technologies, that need to provide alternative access to complex user interfaces authored via HTML, are often left guessing at the semantics behind specific portions of HTML document. As an example, an XHTML document might use a certain HTML construct, such as a collection of DIVs, to create navigation bars, a site-navigation menu, and other GUI-like user interface widgets. To fix the problem we will cover how we incorporate the role attribute, the accessible state properties, and give the object focus using the new TABINDEX feature. Addition of this information will allow the author to provide the necessary information to enable the user agent to support the accessibility api accessed by the adaptive technology. 4.1.1 Provision of the role attribute "What the object is"
Each platform accessibility API has the notion of a role for a GUI object. This is the case for Microsoft Active Accessibility (MSAA), the Java Accessibility API, the Gnome Accessibility Toolkit (ATK), the Mac Accessibility API for Cocoa, or UI Automation for Longhorn (called content type in UI Automation). To add this information we use namespaces to pull in the role attribute from XHTML2 and assign it a value from the GUI Role Taxonomy. Since the XHTML 2 role attribute takes a qname we can use a qname to reference the role attribute from the W3C WAI GUI RoleTaxonomy. In the following example we use namespaces to assign a role of menu to a div. Menu is defined in the GUI role taxonomy. A decision by the HTML working group was to make role a qname and allow others to define sets of standard roles. Furthermore, these roles should be extensible. It is the intent of the HTML working group to have these qnames refer to RDF which defines the element. The RDF should ultimately define the object. The WAI Role Taxonomy for Accessible Adaptable Applications, covered later in this roadmap, introduces the purpose of this taxonomy and how RDF can be used to describe these roles. 4.1.2 Provision of the accessibility state information "What meaningful properties does this object have at this time"
Since this is dynamic content, the state of these new repurposed objects will change. The WAI Accessible States and Adaptable Properties Module shall provide the common accessible properties needed to support the accessible state or property information provided by the platform accessibility API defined previously. This specification was created based on an analysis of the accessibility properties defined in MSAA and ATK. To pull in these information we again use namepaces to extend XHTML. The following example extends the previous by adding the haspopup accessibility property. 4.1.3 Provision of the keyboard or input focus "What object am I working on? Virtually all adaptive technology solutions, such as screen readers and onscreen keyboards, need to know what object currently has focus. For example, I might want to insert text into the current object with focus or I might want to announce information about the object that has focus. Today, HTML 4.01 and XHTML 1.x limit script authors to only being able to provide focus to form and anchor elements yet the Document Object Model Specification allows all elements to receive events including keyboard events. This means that HTML, by design prohibits script authors from making all HTML elements keyboard accessible. This single problem has impacted the usability of web pages whereas gaining access to all elemens means using the tab key on desktop browsers. This slow, unproductive, approach makes it difficult for portal navigation whereas all active elements must be tabbed through to get to an active element in the last portlet in a document. To solve this problem in XHTML 1.x we are incorporating a feature in Firefox and IE to define the tabindex for -1. This allows a script author to give an element focus without placing it in the tab order: The following table desribes these changes which will be incorporated into the new Accessible Adapative Application specfication. Positive, e.g. tabindex="33" Yes Tabindex value directly specifies where this element is positioned in the tab order. XHTML 2 will allow all elements to receive focus, eliminating the need for this tabindex modification. In addition to the common roles which will reside in the GUI Role Taxonomy, XHTML 2.0 defines a collection of common roles that define pertinent parts of a document for the purpose of accessibility. User agents may incorporate device equivalents, such as key mappings in the case of a desktop user agent, to navigate to these sections of a document independent of the web site. The addition of these semantics allows the user agent to provide standardized navigation to common document sections. This is especially important for portals to improve the usability. These may be used as attributes in XHTML 1.x by applying them to sections of the document as shown in this example. This is being worked by the WAI coordination group as a best practice. The example above was taken from the header from the Career Center web page at the University of Illinois at Urbana-Champaign. Students form this university, under the Jon Gunderson's guidance created Accessibility extensions for Mozilla/Firefox, in part, allow a page author or user to launch a table of contents to viewer to list the landmarks. Keyboard navigation of the table of contents causes the corresponding document section to be highlighted. It will be necessary to describe how to interact with a document element having a specific role. This is critical when defining roles not included in the common set specified previously. It should be possible to describe UI widgets and how to interact with them. RDF is a way for using data to describe data and provides a W3C standards-based approach to represent this information. Figure 4.0 Shows a basic RDF mapping which defines a set of terms and relationships defining an object. At the center is a Widget object that defines common states and properties for all GUI widgets. The Button object extends Widget and inherits defined accessibility properties from the superclass Widget. It also defines a relatedConcept property to a Link object. The ButtonUndo role extends Button and an instance of extends of Button. It has a relatedConcept of an HTML input object. ButtonUndo will introduce Dublin Core meta data such as the description of the object. The power of this design is it allows user agents to go back into the corresponding RDF markup and determine what properties it supports for Accessibility API mapping. Also, new web authoring tools can use the self describing RDF to help test for accessibility conformance to semantic web markup representing the role. Additional, middleware solutions can now make intelligent transformations of Web Content by processing the semantics behind rich browser and rich structured frameworks to adapt accessible solutions for a broader user base. Our immediate goal is to fix the accessibility problem with scripted web content. Assistive technologies will use the standard roles to determine how to render most content. For custom widgets they should be able to determine how to interact with it using the RDF document defining the roles. Knowledge representation of web content - As a secondary benefit, Roles improves compatibility Knowledge-Based Services and the Semantic Web. In integrating accessibility and the semantic web, accessibility can be moved forward, paving the way for customized accessible searches and intelligent user agents with additional applications. If it is known that a page hyperlink has the role of taking the user to the site’s home page, then that knowledge can be used to create enhanced accessibility in different ways in many different scenarios, such as icons or accesskeys. If it is known that a text box is for the user email address then the user agent can support users filling in the form by labeling it with an icon or symbol, automatically validating it, or even form filling. Interoperability between applications and assistive technologies requires event notification for accessibility. The events defined in Table 2.0 will be fired via the user agent. The accessible value and state property changes will be generated in response to changes in the DOM attributes as defined by the AAA specification. User agents supporting the platform accessibility API, will support event notification such as the MSAA EVENT_OBJECT_STATECHANGE or EVENT_OBJECT_VALUECHANGE events. Industry evolution has shown that we can do things better and produce more consistent cross-platform solutions which support accessibility and reduce the enablement efforts of the author. HTML is a device dependent solution. An impaired user needs to make an intelligent decision as to what actions they can perform on a document element. An impaired user wishing to enumerate the available actions that may be performed on a page element is confronted with the non-informative information provided by HTML's intrinsic events. The information provided is very device specific and non-informative. For example, what action does an event handler perform in response to an onclick event? This is problematic for blind, low vision, and mobility impaired users. There may be more than one action to be performed on a given element. A mobility impaired user would like to enumerate the handlers and make a decison. Generating the appropriate mouse event is problematic. Blind users and low vision users would like to make informed decisions before they accidentally make a purchase. Some information can be gleaned from the UI by sited users, however some of this information may be obscured from view due to the use of a magnifier by low vision users. The HTML working group is working to address this problem through the use of XML events. XML Events provide XML languages with the ability to uniformly integrate event listeners and associated event handlers with Document Object Model (DOM) Level 2 event interfaces [DOM2EVENTS]. The result is to provide an interoperable way of associating behaviors with document-level markup. Through the use of XML this is done declaratively. Having the ability to use XML to integrate listeners and handlers will allow us in in future versions of the XML event specification to tie a descriptive purpose to the handlers. This problem also manifests itself when encountering event handlers authored via element script. XML Events and XML Handlers solves the first half of the accessibility problem by introducing a clean declarative syntax while encouraging authors to use high-level event names and descriptions. This gives the author the flexibility to assign device specfic mappings to event handlers while providing for added semantics. In XForms 1.0, we have gone one step further by introducing declarative action handlers for commonly used event handlers, e.g., setfocus. The combination of REL navigation semantics, XML events, XML handlers, and XForms declarative markup set the stage for an access key replacement. Access key suffers from a lack of semantics and support for device independence. Dynamic web content implies the use of event handlers. From an accessibility perspective we need to assist the user in determining how to interact with a web application in a device independent way. The provision for named events and the ability to bind event handlers to document element events in the XML Event specification is critical. At the time of binding we can incoporate the additional Role information as well as make use of the name information to provide semantics about what the event handler does. In the future, this information should be mapped to the available accessibility infrastructure by a, UAAG conforming, user agent on the platform. Once complete, a user agent conforming to the DOM 3 event specification will allow for enumeration of event handlers with corresponding descriptions. The ability to ask this information has been added to the EventTarget interface in DOM3 events through the hasEventListenerNS method. Platform accessibility API like the Gnome ATSPI Accessible Action interface may now enumerate these actions for assistive technologies so that the user may be provided with descriptive information to make an informed decision as to which action to take. Authors wishing to incorporate XML events may do so to existing XHTML 1.1. markup through modularization. Standardized, powerful set of pre-defined declarative event handlers covering use cases. This introduces semantics and therefore assists accessibility. You are also notified of events which actually occur during form operation. These types of events allow applications, like a screen reader, to provide alternative modalities such as speech. In addition to device independent events, XForms also provides another powerful feature by its model-view-controller design. XForms separates content from presentation while embedding relevant meta data in user interface constructs. case includes a Boolean attribute called selected that allows the group of controls within that case to become active. This is important to assistive technologies, such as a screen reader, which would monitor the document to determine when to speak selected elements. If none of the cases within the switch are selected, the first case in document order becomes active by default. How those elements are rendered visually is of no consequence. The semantics are preserved. If the state is computed to be invalid, out-of-range, or required this value should be returned as true. In the case of MSAA the user agent should provide a specialized API to return its value. Alternatively, if the user agent provides a specialized API for XForms it may provide invalid(), outOfRange(), or empty() (returns true when required but not available). This information is computed from the instance data associated with the form element. The user agent will need to set this to true when there is no binding to data in a form element. Elements with this state should not be made available to users. ATK_STATE_VISIBLE : false if hidden=true. This attribute is implied based on the element type in XForms. It is up to the User Agent to do the implied mapping to the appropriate state. This attributed is determined from from the XForms model. The XForms implementation should provide a method either in the DOM or a specialized API since this value should be calculated as optional may be set to true or be evaluated based on an XPath. For example, a method of isOptional() is suggested. required <select1>, <item>, <textarea>, <secret>, <input>, <choices> no mapping. This attributed is determined from from the XForms model. The XForms implementation should provide a method either in the DOM or a specialized API since this value should be calculated as required may be set to true or be evaluated based on an XPath. For example, a method of isRequired() is suggested. This is state is managed by the user agent. Use of secret as a tag implies secret. Note: <itemset> should be expanded by the user agent. An attribute of selectable should automatically be set by the user agent as long as it is bound. singleline <input> implied by <input> being representative of its role. This saves authoring time by levering the XForms model to support accessibility directly. IBM is beginning development platform accessibility support for XForms in 2005 as a contribution to the open source community. XHTML 2 is being desiging to build accessibility in from the ground floor. It is clear from the roadmap that some XHTML 2 accessibility features are borrowed through the use of name spaces to extend XHTML 1.1 through modularization. XHTML 2 incorporates the role attribute, document landmarks, XForms, XML Events, and a number of other accessibility features. It introduces an access element designed to address device independence, semantic navigation, and activation. It also benefits from the WAI GUI Role Taxonomy which is a cross-cutting technology. The XHTML 2 specification is still in working draft form. A future list of the extensive accessibility features of XHTML 2 will be necessary. User agents are required to provide interoperable interfaces to assistive technology run times to produce a usable experience for users with a specific disability. A task of the roadmap will be to define requirements for UAAG. This is necessary provide a cohesion between user agent and author supplied state information. User agents may need to adjust their user interface in response to state information stored in document elements. For example, an element having the focusable attribute set to true should result in a desktop user agent's placing the element in the keyboard tabbing order. The WAI PF working group and IBM are working with assistive technologies to ensure support of the roadmap. The WAI PF working group will be looking at ways to address authoring tools requirements for testing the accessibilitty of scripted web content. The development of authoring tools to assist the author in testing dynamic web content for accessibility is important. Today's accessibility fixers and checkers test to static web content. Accessibility properties will change during web page use. Web authoring tools should consider reusable accessible widgets and prompt for variable accessibility information such as title text. The use of RDF in the WAI GUI Role Taxonomy should be used to ensure which properties may be supported by which roles. W3C Authoring Tools Accessibility Guidelines 2.0 is developing requirements that will better address authors will creating accessible, dynamic, scripted web content. At this time, IBM is doing much of the prototyping of this work. Sample markup has been contributed by IBM and may be found on the Mozilla accessibility web site. IBM is working on a best practices document and is contributing to WCAG 2.0 implementation techniques. UB Access is contributing much of the RDF design supporing the Role taxonomy work. At this time these guidelines are not yet made available. The following table is the technology deliverable Timeline for the Dynamic Accessible Web Content Roadmap. This roadmap is designed to address the accessibility of dynamic, scripted, web content that may be rendered in today's browser while bridging to future declarative standards, such as XHTML2, in the W3C. The extensions being created for XHTML 1.X are intended to be cross-cutting. This roadmap clearly indicates that WCAG, ATAG, and UAAG should be in lock step for a common strategy. All groups are impacted and are interdependent. Additionally, close work with mainstream working groups, like HTML, CSS, and Device Independence will not only produce a working solution but it will produce a working solution that will have a broader impact than just XHTML. The following table indicates the specifications to track which address the gaps in the Roadmap. Gnome Accessibility Project (GAP) State and StateSets.